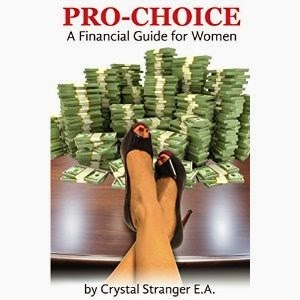 Pro-Choice: A Financial Guide for Women by Crystal Stranger, E.A. Crystal Stranger’s “Pro Choice: A Financial Guide for Women,” by Crystal Stranger, is a thorough guide for taking control of your financial situation. The book springboards off research that shows the distinct advantages women have in investing and business and explains how to use these to accomplish financial goals. When I say this book is comprehensive, I mean it. The book covers everything from education to taxes to retirement accounts, all in a way that is easy to understand. Stranger's uses her experience as a financial consultant and tax expert to give you an inside look at being successful financially without drowning you in jargon. One of my favorite things about the book is that it uses examples to help you understand the material, which really helped me to understand the ideas. Another thing I like about the book is that it acknowledges that everyone is different and encourages you to create a financial plan that meets your needs. I'd recommend this book to any woman who wants to read a straightforward book that’ll give her the knowledge to accomplish her financial goals!